In 1897, Walter Withers won the inaugural Wynne Prize for Australian landscape painting with The Storm, 1896. He won in competition with Tom Roberts’ masterly A Break Away!, 1891, Sydney Long and W. C. Piguenit being among the other finalists. The Storm was acquired by the Art Gallery of New South Wales and subsequently included in the Exhibition of Australian Art in London, which opened at the Grafton Galleries, in April 1898. Roberts’ A Break Away! was also there, together with the best of Australian paintings assembled by the Trustees of the Art Gallery of New South Wales ‘to obtain a more extended attention to Australian Art beyond the Colonies…’.1 Tranquil Winter, 1895, another of Withers’ landscapes included in the exhibition, had been purchased by the National Gallery of Victoria the year it was painted. It moved the art critic of London’s Pall Mall Gazette, R.A.M. Stevenson, to declare: ‘This is, perhaps, the most beautiful canvas in the show’.2 Success followed success with Withers’ Early Morning, Heidelberg, 1898, also from the London exhibition, being purchased by the Art Gallery of South Australia through the Elder Bequest Fund in 1899. To top this off, Withers won the Wynne Prize of 1900 for the second time with Still Autumn. And that same painting was awarded a silver medal for the best landscape at Bendigo’s Victorian Gold Jubilee Exhibition of 1901. Withers was living at Heidelberg, near Melbourne, during this time. The years 1894 to 1900 are, with good reason, generally regarded as his most successful. According to his wife, Fanny, ‘Nature was his great teacher’.3 Working as a jackaroo for eighteen months after arriving in Australia in 1882, gave him a deep understanding and love of the Australian countryside, especially the peopled, domesticated scenes of farms and grazing animals. While peaceful moments and the quieter moods of nature had great appeal, he also liked to paint her garbed in the best of seasonal dresses. Summer heat and gathering storms attracted his brush. 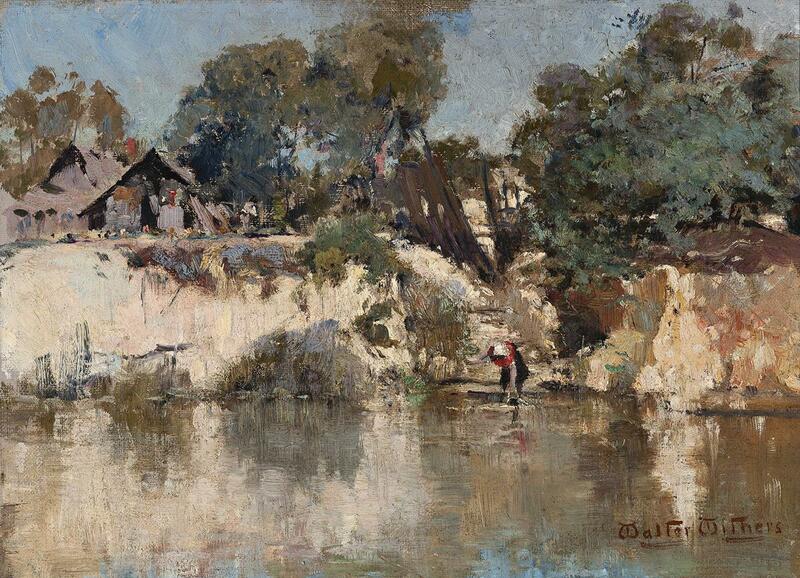 He titled one painting 110° in the Shade; another, Country Road, c.1898, in the National Gallery of Victoria, is similarly drenched in sunlight.4 Withers once wrote to his daughter Gladys: ‘The drought is very severe but the country looks very beautiful, in its garb of blue and gold;…’.5 Yarra River Cottage, c.1898, from the very time Withers was at the height of his creative powers, captures the shimmering heat and sparkling colours of summer with a freshness derived from being painted en plein air. The feeling of immediacy and sense of stillness are palpable. The characteristic foreground stretch of water reflects the cliff banks, the woman drawing water highlighted in touches of pure red, white and black. Withers occasionally capped his figures in red, the accented contrasts providing a central focus around which nature thrives in abundance. The Last of Summer, 1898, in the collection of the Art Gallery of Ballarat, gives another example close in time, the woman’s red shawl over white being the centre around which the changing weather storms. By contrast, Yarra River Cottage is high keyed, celebrating a moment of brilliant summer light with Impressionist verve in strokes of broken colour. 1. ‘Catalogue introduction’, Exhibition of Australian Art in London, Grafton Galleries, London, 1898. Tom Roberts’ A Break Away! was purchased by the Art Gallery of South Australia in 1899.